I am honestly not sure who gets more excited each time we set up a new dramatic play area — me or the preschoolers! 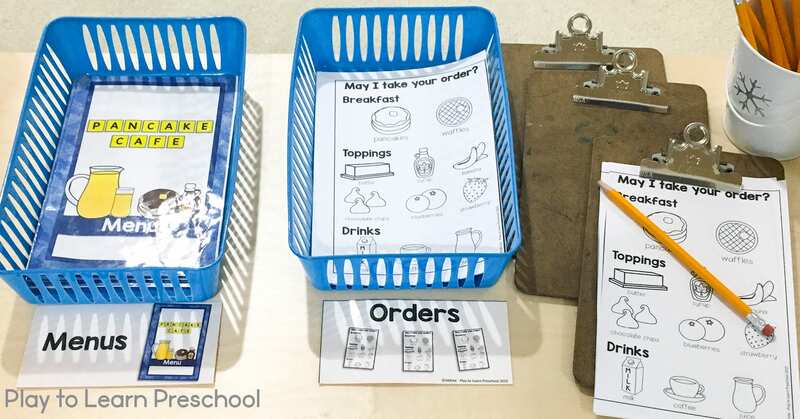 Our pizza parlor was such a big hit last month that I wanted to stick with a restaurant theme. 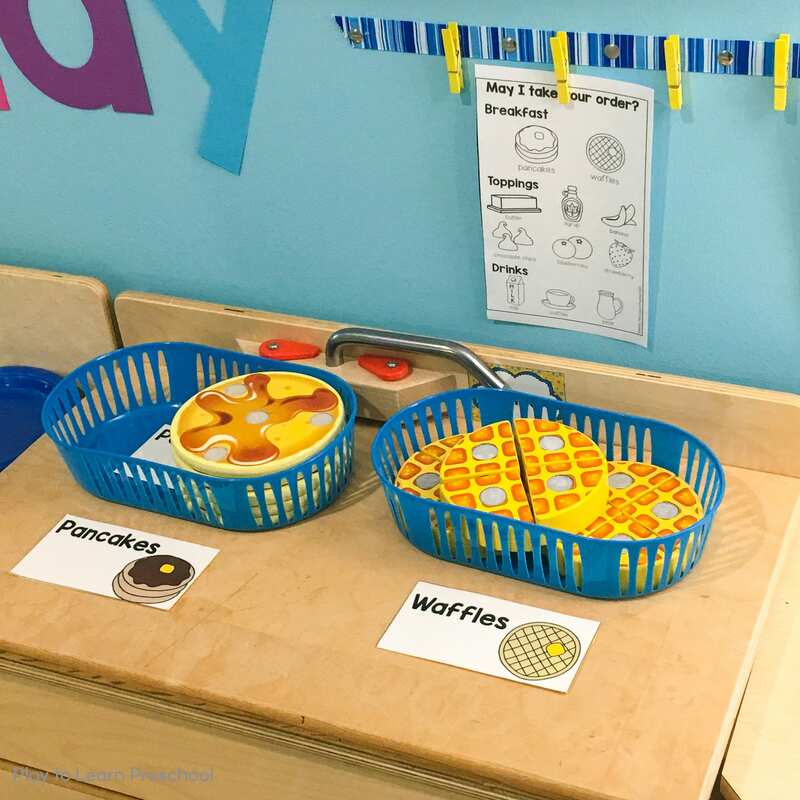 When I came across Melissa & Doug’s amazing pancake and waffle sets, I knew exactly what we would do — a Pancake (and Waffle) Breakfast Cafe in the Dramatic Play Area! 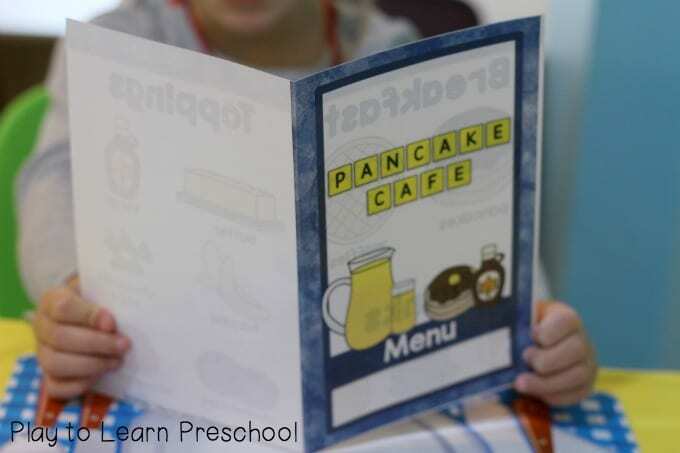 Welcome, Friends, to the Play to Learn House of Pancakes! 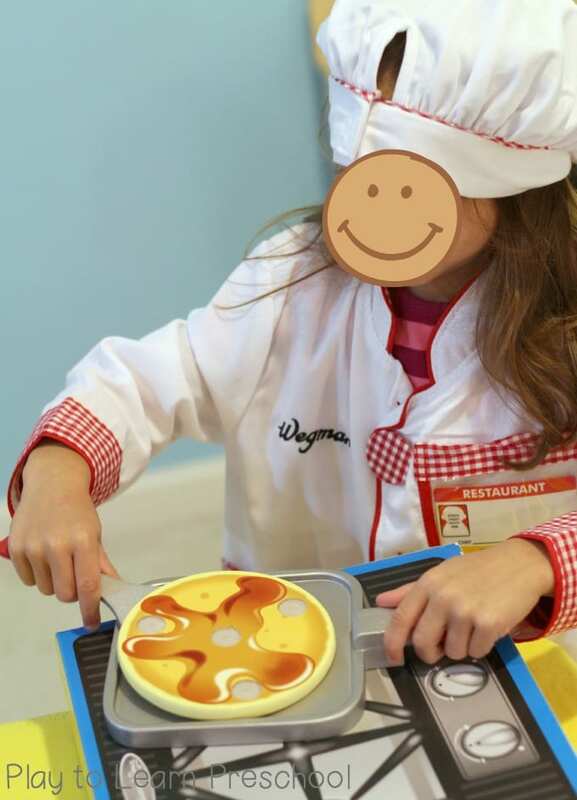 Our skilled pancake chefs serve breakfast all day long. 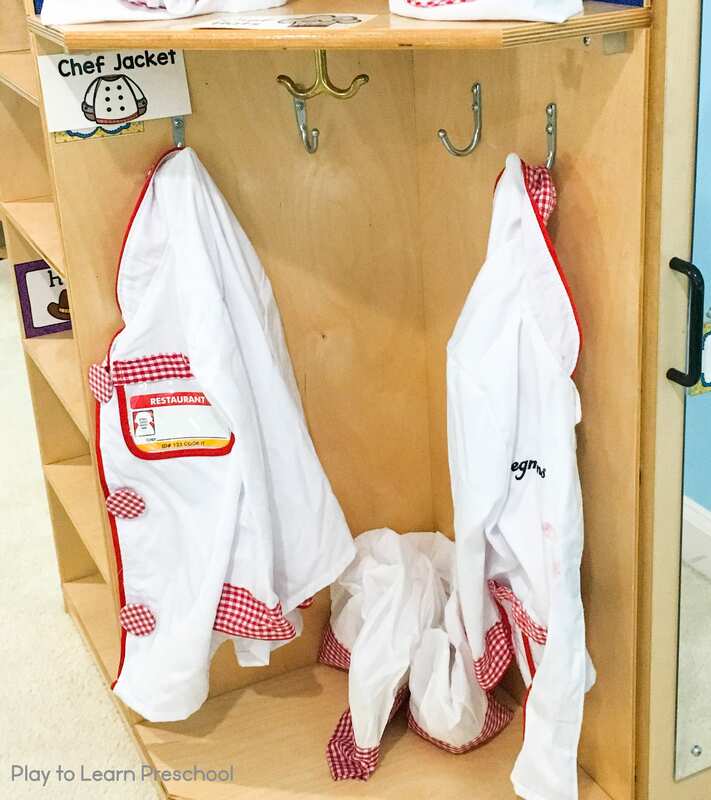 The chefs can put on their special hats and white coats (also from Melissa & Doug!). 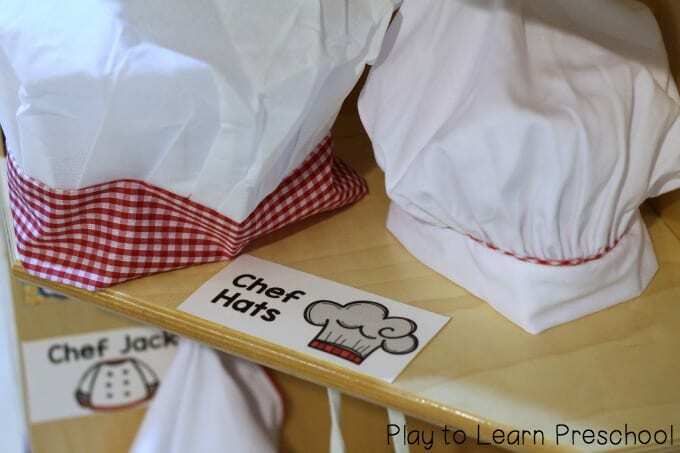 The waiters and waitresses will want to wear aprons to make sure that their clothes don’t get covered in pancake batter. 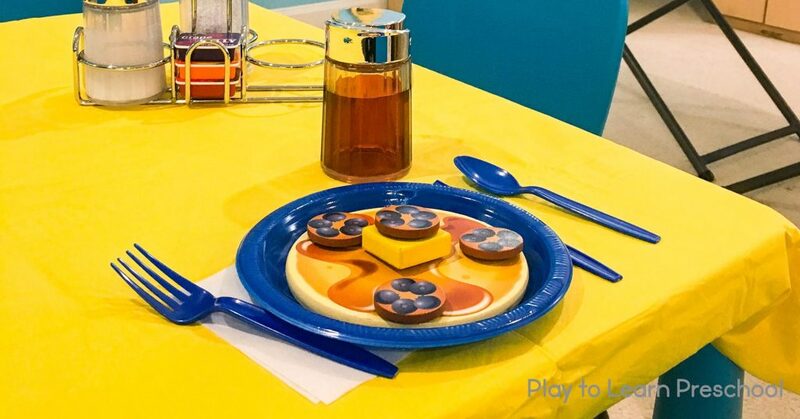 If you’re coming to the Pancake Cafe as a hungry customer, the host will be happy to show you to your table. 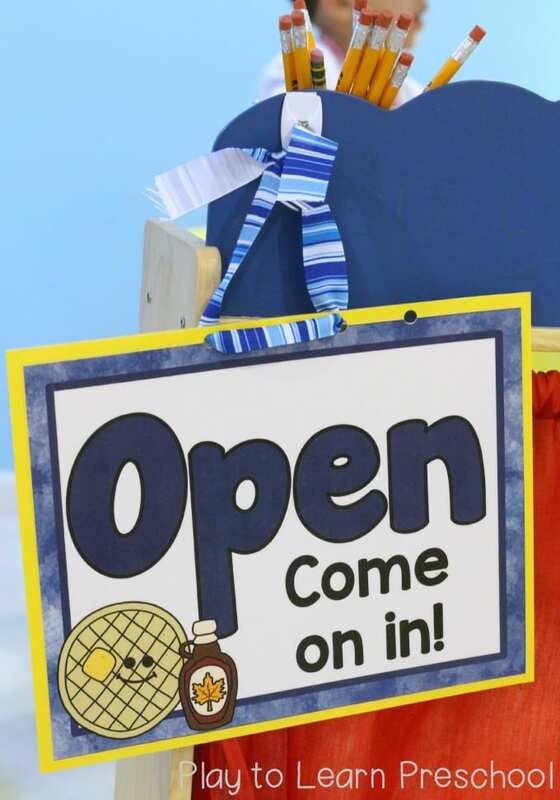 He can also answer any questions that you might have about our menu. 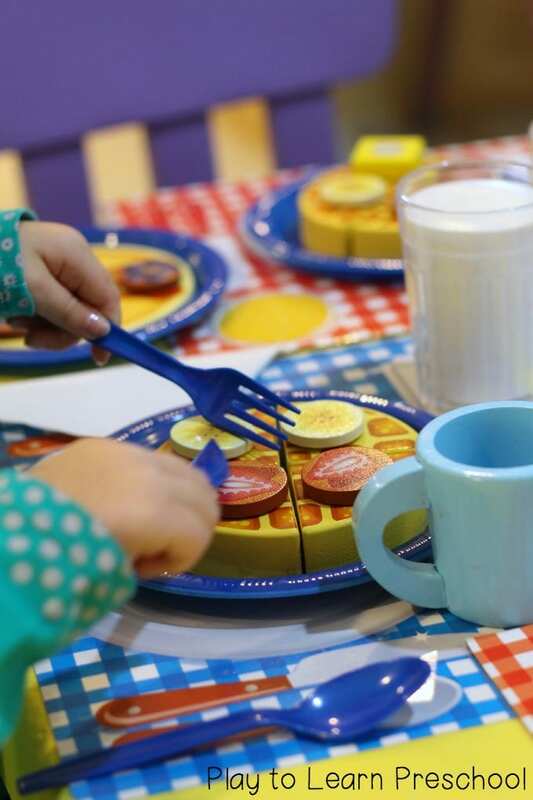 The Pancake Cafe offers two main types of food: pancakes and waffles. 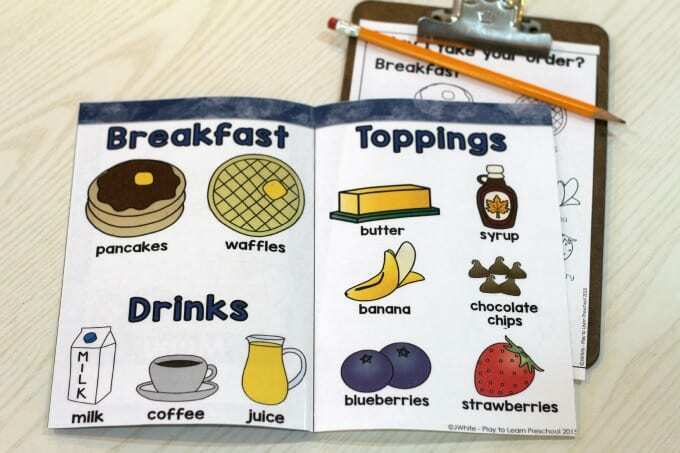 You can customize your order with 6 different toppings and wash it down with milk, coffee or juice. It gets awfully busy at the Pancake Cafe during the breakfast rush. 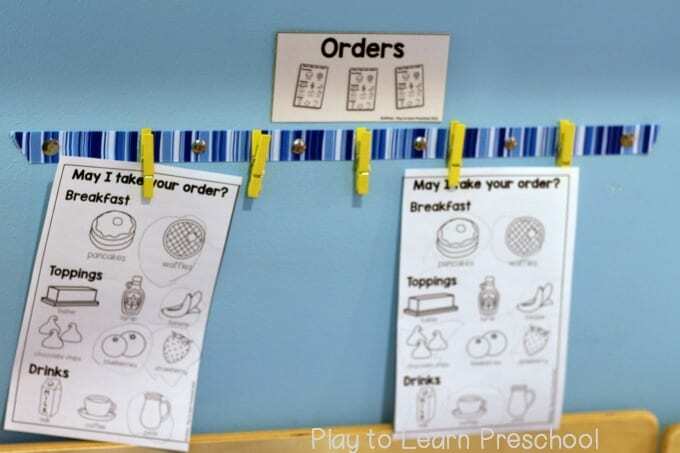 Our chefs keep track of all the orders on this clothes pin order board. Sometimes there are more chefs than customers, so we offer pancakes and waffles to our stuffed animals, too. 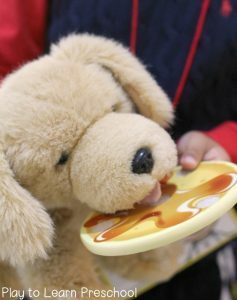 Doggy says the pancakes with syrup are sticky and delicious! 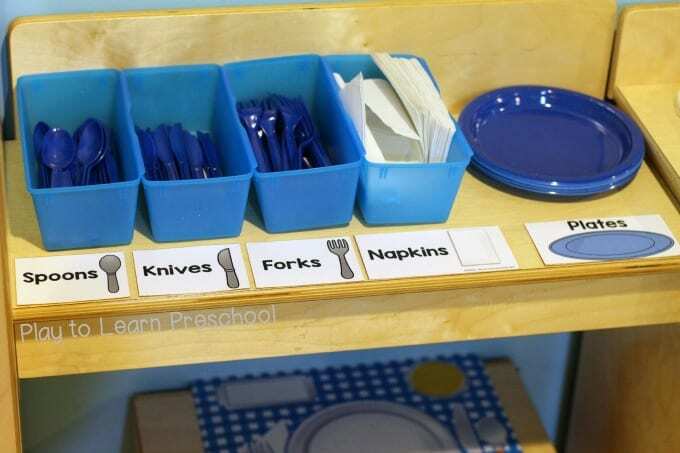 I love so many things about this dramatic play area. 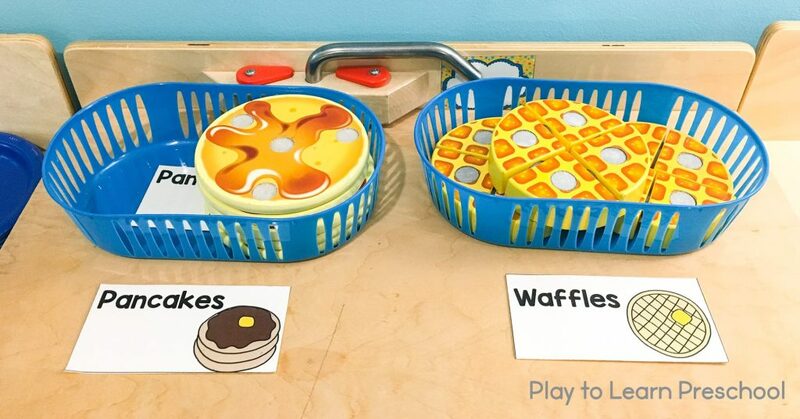 Both the pancakes and the waffles have velcro circles with interchangeable toppings. 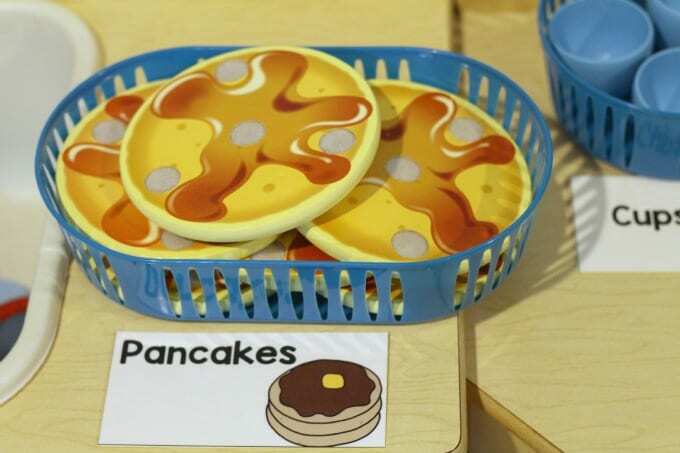 The little wooden spatulas have velcro on them too, so the pancakes don’t end up on the floor when they are being flipped. 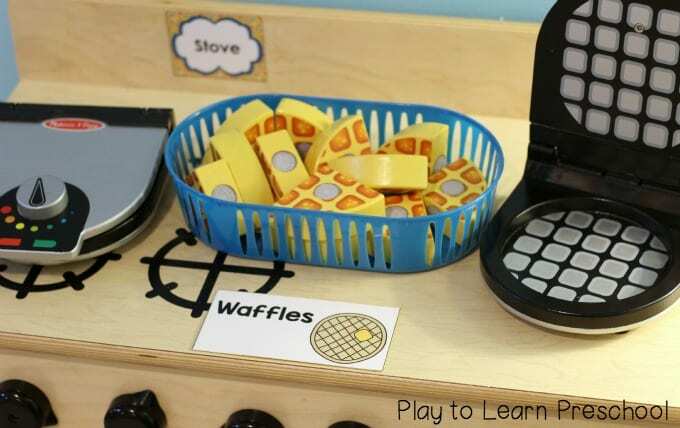 The waffles have to cook in the waffle iron before they are covered in toppings! 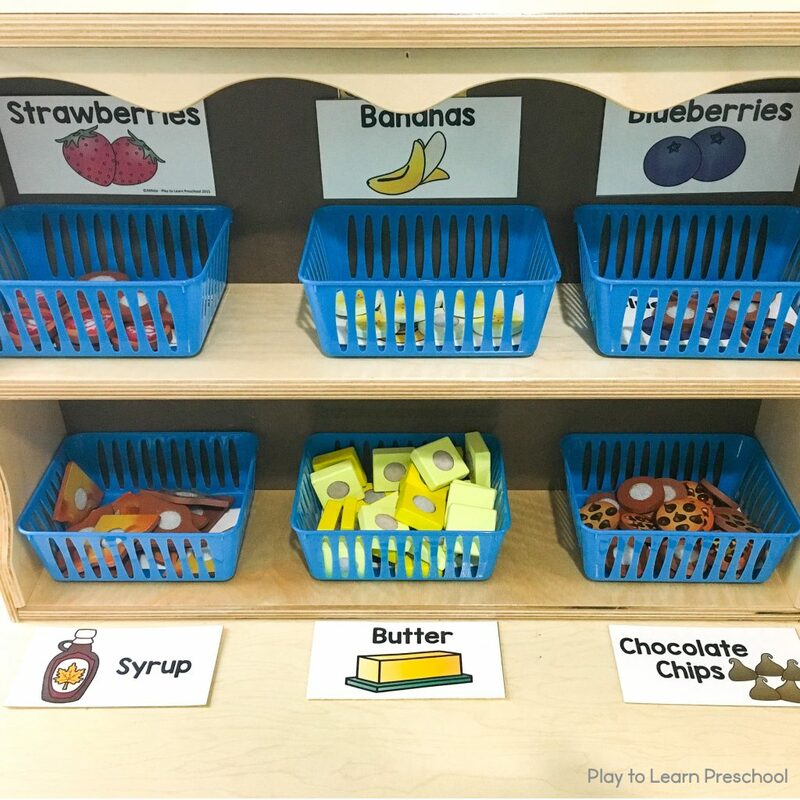 Our topping bar includes 6 scrumptious choices: syrup, chocolate chips, butter, banana slices, blueberries and strawberries. 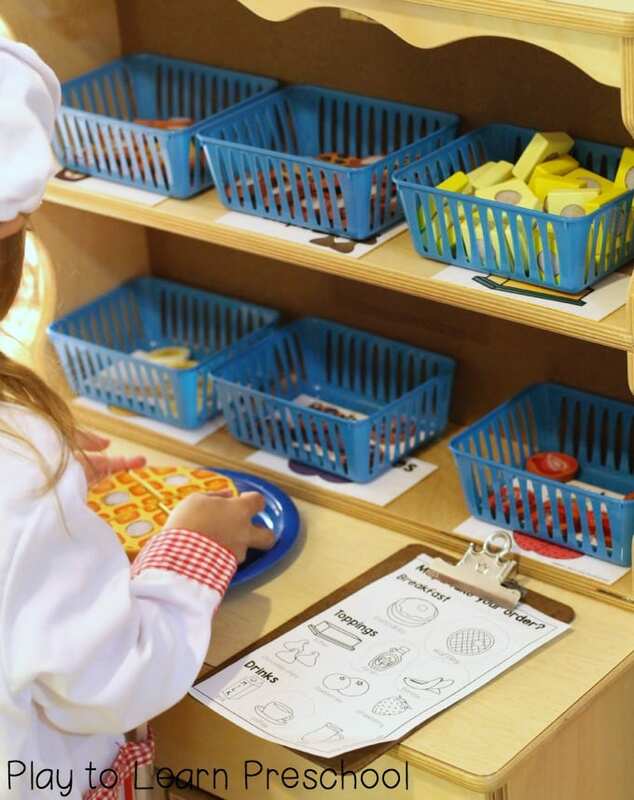 We labeled both the bottom of the basket, and the spot on the shelf where the basket belongs to assist our chefs in finding what they need and putting it back when they are done. 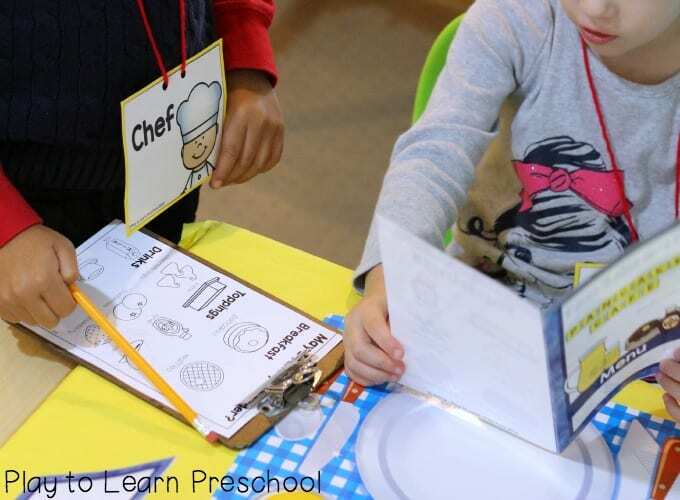 Learning to “read” an order form and make a plate of food that matches what the customer wants takes a lot of concentration! Would you like juice or milk to go with your waffles? Or maybe it’s been “one of those mornings” and you would prefer coffee?! 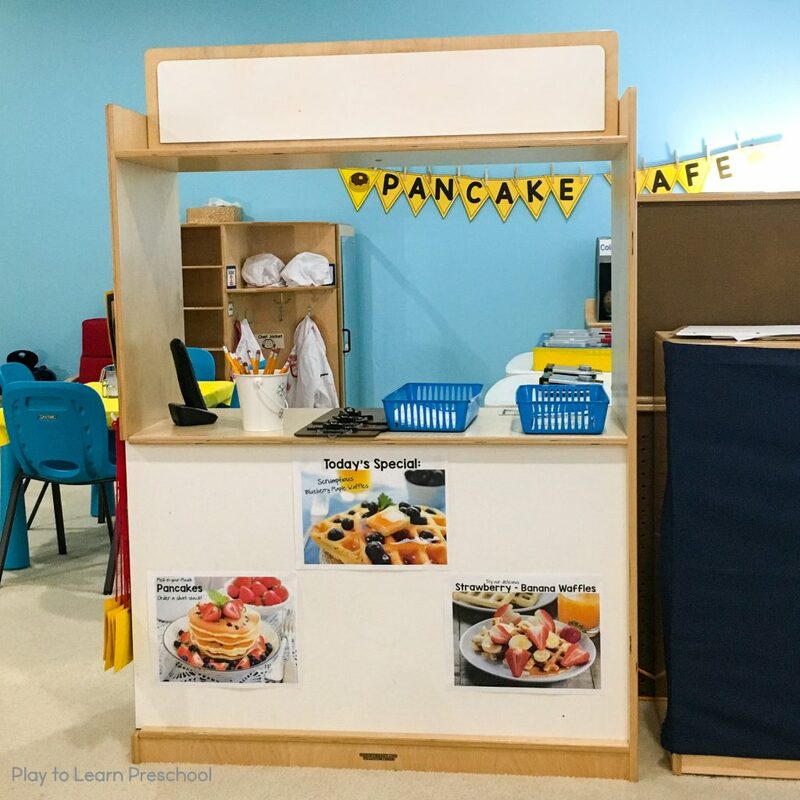 We hope that you enjoy your breakfast at the Pancake Cafe as much as we enjoyed making it in the Dramatic Play center. 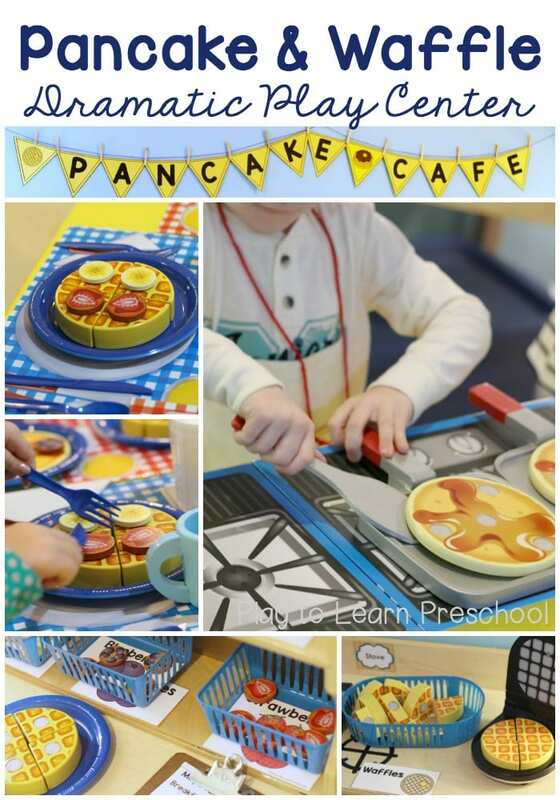 All of the signs, labels, name tags, menu and order forms are included in this Pancake Dramatic Play set. 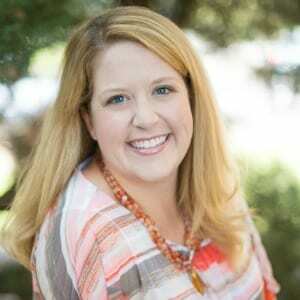 I’d love to see pictures of your children using it! Feel free to share them on my Facebook page, or tag me on Instagram. 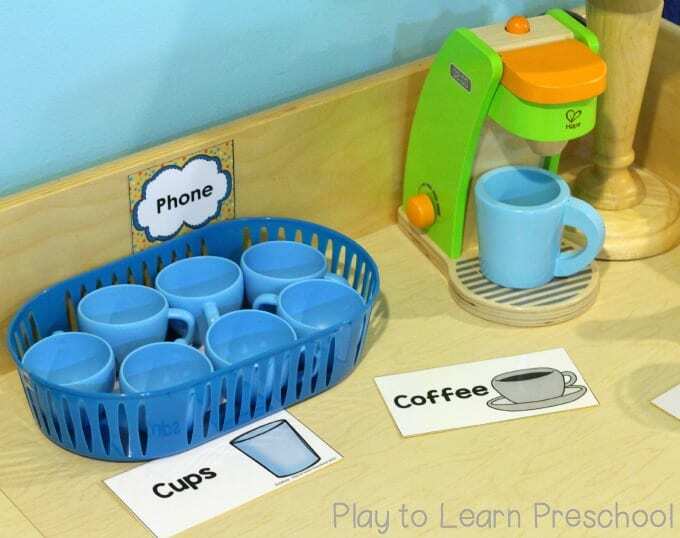 Have you already downloaded all of the FREE printables for your basic Home Living Dramatic Play area? Just click the picture below and sign up for our free newsletter. After you confirm your subscription, you will receive an email with the Home Living set in an instant download. Enjoy!! Love this! 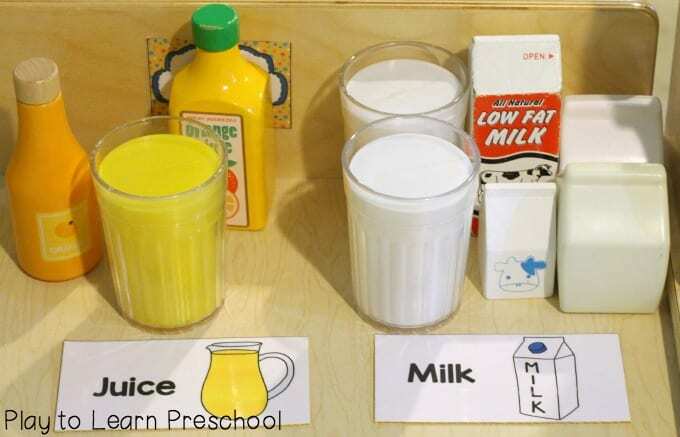 Please tell me where you got your glasses of milk and oj? 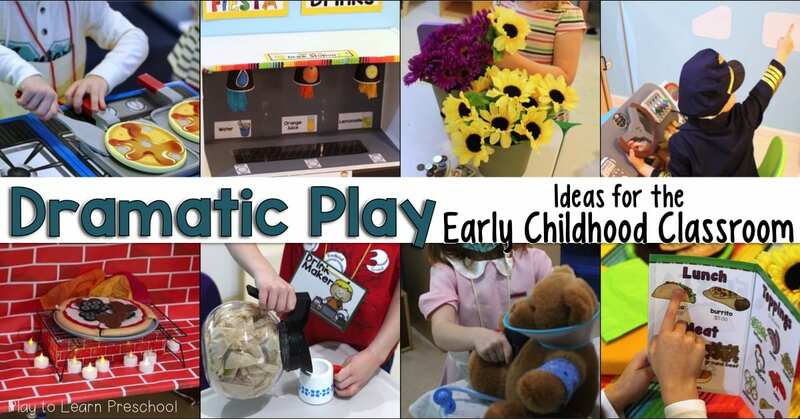 Thank you for all of your great dramatic play ideas. Unfortunately they keep me awake at night figuring out how I can create them in my classroom. 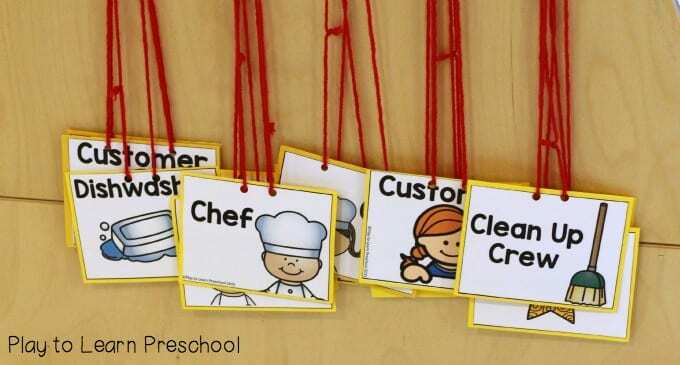 Your centers are always so beautifully neat and organized! That M&D waffle iron is just too cute as well. Thank you so much Karen! 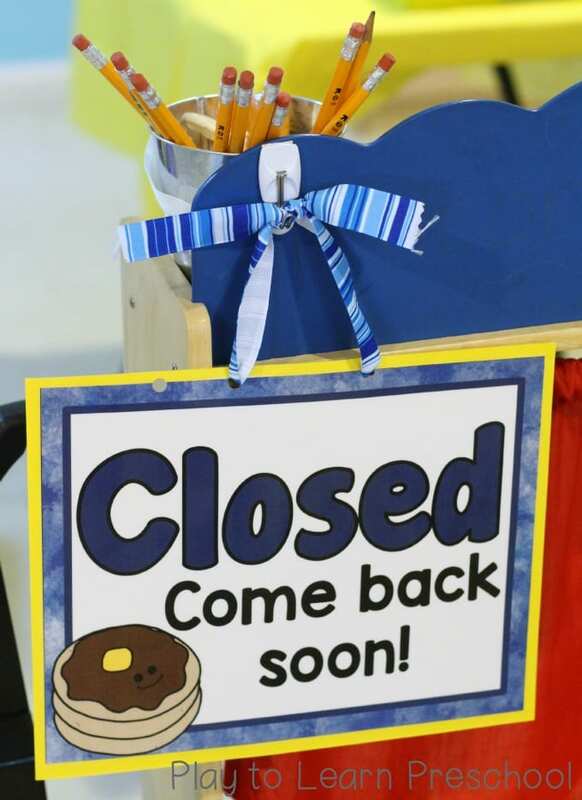 Our students love that center. Amazing ideas. Thank you so much.